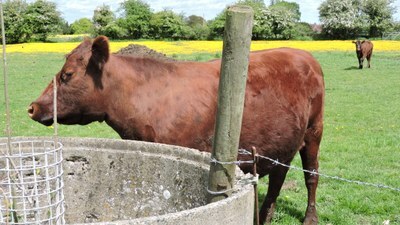 The Red Poll cattle were developed as a dual-purpose breed in their native counties in England. Breeders sought a type that would fatten readily rather than be of extreme size. A good milk flow was also considered important in selecting breeding stock in the development of the breed in its native land. 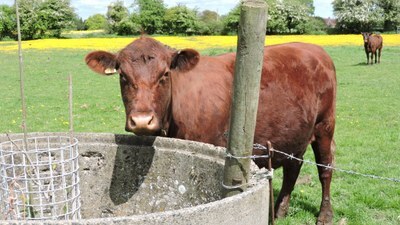 The counties of Suffolk and Norfolk in England are the original homes of the Red Poll. These counties, which lie in a low rather marshy section of England, border the North Sea and have soil that is generally lacking in fertility. The first general agricultural records of England record a great interest in dairy, particularly in Suffolk County. However, the farmers did not specialize in dairy animals but preferred cattle with a combination of milk production and high quality carcasses. No one knows when the first cattle were introduced into Suffolk, but it was thought that cattle were brought to that area by the Romans. This breed is universally polled, that is without horns; the size small, few rise when fat to above fifty stones (fourteen pounds). . . . If I were to describe the points of certain individuals . . . a clean throat with little dewlap; a thin clean snake head; thin legs; a very large carcase; ribs tolerably springing from the centre of the back but with a heavy belley; backbone ridged; chine thin and hollow; loin narrow; udder large, loose and creased when empty; milk-veins remarkably large, and rising in knotted puffs to the eye . . . many of these beasts will fatten remarkably well; the flesh of a fine quality; and in that state will feel well enough to satisfy the touch of skillful butchers. The best milkers I have known, have either been red, brindle, or yellowish cream coloured . . . the quality of milk is very considerable indeed. a small, hardy, thriving race; fattening as freely and finishing as highly at three years old as cattle in general do at four or five. They are small boned, short legged, round barrelled, well-loined, thin-thighed, clean chapped; the head, in general, fine, and the horns clean, middle sized and bent forward; the favorite colour a blood-red with a white mottled face . . . and if the London butchers be judges of beef, there are no better beasts sent to Smithfield market. The two qualifications, namely the superior quality of their flesh, and their fattening freely at an early age, do away with every solid objection to their size and form. Current selection criteria on Red Poll in the United States is primarily for beef production. The first Red Poll Association was organized as the Red Poll Cattle Club of America in 1883. The association was re-incorporated in Nebraska in 1947, and the name changed to the American Red Poll Association in 1975.